Kune Kune is a small breed of domestic pig from New Zealand. Kune Kune are hairy, rotund build and may bear wattles hanging from their lower jaws. Their colour ranges from black and white, to ginger, cream, gold-tip, black, brown and tricoloured. They have a docile, friendly nature, and – like the pot-bellied pig – are now often kept as pets. The Kune Kune of Anam Cara will be involved in the equine programs as therapy pigs. In early 2015 my sister, a dog trainer and fellow animal lover suggested we look into a heritage breed of pig known as the Kune Kune. Although still quite rare in Canada this New Zealand breed has made a resounding comeback from its near extinction in the ‘70s. My partner, Steve, and I knew nothing about pigs but were intrigued with the idea of expanding our farm family. After extensive online research and two field trips we were committed: Kune Kunes are friendly, docile and smart and more than easy to fall in love with. After locating a breeder in Olympia, Washington, we started the importation process. Our initial idea of having one pig soon transformed into three piglets and a plan for a small breeding program. In December 2016 we packed up Finn (nee Galileo), Scarlett and Bernadette and headed for the Canadian border. After a month in quarantine, we introduced the piglets to the rest of our family which includes horses, sheep, dogs and cats. 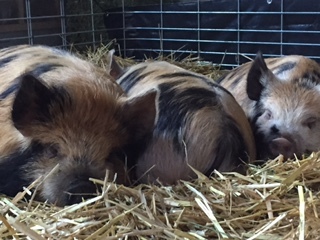 We have thoroughly enjoyed getting to know the Kune Kunes both individually and as a breed. Their intelligence exceeds that of dogs and, more importantly, as our therapeutic work on the farm is based on relationship, they seem open and willing to developing loving connections. Finn, Bernadette and Scarlett are often included in our programs where children and youth can hop in their space to give them a greeting, a snuggle or even read them a story. Bernadette’s temperament is also characteristic of this breed. She is highly social, curious, intelligent and gentle, and loves a good chin and belly scratch. As a first time mom her pregnancy and delivery went well. Her nurturing instinct is demonstrated by her excellent mothering skills. She is very tolerant of people in her space when nursing and also with people interacting with her piglets. Our breeding program is small;thoroughly dedicated to nurturing the Kune Kune’s naturally docile temperament through gentle, mindful raising along with basic skills training. Unlike kittens and puppies, piglets are born with eyes and ears open ready to hit the ground running. From day one we interact with the piglets so that they are comfortable with humans. Similar to an early socialization and enrichment program for puppies, our piglets are exposed to a variety of sights, sounds and smells, given access to a number of different surfaces to walk on (grass, gravel, concrete, ramps), and exposed to a number of people in a positive manner.We also get them started on with the foundation of litter box training, coming when called, polite manners/sitting for meals and harness/leash familiarization. Although their innate ability to squeal is strong, we get them used to being picked up and held as well as having their trotters touched and handled for hoof trimming. But it’s not all work for these piglets, they are given regular doses of belly rubs to induce a sense of calm and relaxation. Is a Kune Kune right for you? Are pigs allowed where you live? Check your municipality by laws. Are you committed to being the family to your pig during its lifetime 12-15 years? Do you have the space and financial means to care for your pig? Do you have a vet that is familiar with pigs? Will the vet do a home/farm call or are you able to load up and drive the pig to the vet? Our goal is to find the best fit for our piglets with a forever home in a family able to provide the best life for them. Like any animal, it is a long-term commitment. We encourage potential families to do as much research as possible to know what to expect and what is necessary to have these lovely piglets thrive. For example, although small at birth, Kune Kunes can still grow up to weigh 200-250 lbs. The last thing we want is for any of our adopted-out piglets to be found unsuitable and end up in a rescue. Once a family has been selected to purchase one of our piglets, a contract is signed to solidify the commitment and create a process to manage any changes that may occur with their new family. If your application to purchase is approved, you will be required to sign a sales contract. Click here for an application. Once an application is approved, a non-refundable $350 deposit will be required. All piglets will have vaccinations, microchips and be de-wormed. REGISTRATION is pending DNA confirmation. Castration can be arranged for those piglets in a non-breeding home. Percy and Scotty are together in their new home in Mission, BC. Percy is also a favorite largely because he is the smallest. Although Indy was born the smallest, Percy has been slow to grow although his feisty eagerness ensured he never missed out on a feeding. Percy would make an exceptional pet or addition to a hobby farm. Scotty is the biggest of the herd with strong correct legs and back. He has a typical Kune Kune face, lovely ears and short snout. He loves to throw himself at people’s feet looking for belly rubs. He would be a wonderful addition to any breeding program and also a pet home or hobby farm. Indy is staying with us and is now a barrow. Although he likely would have been an exceptional breeding boar, he is more valuable to us as a developing therapy pig. Named after both Independence Day (born July 4) but more appropriately Indiana Jones. He is curious, the first to try new things and loves meeting new people. We will spend more even more time with him once his siblings are in their new homes. Indy is love.